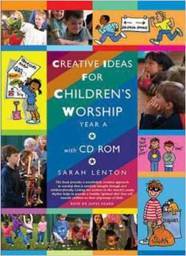 Creative Ideas for Children's Worship: Based on the Sunday Gospels Years A, B, C.
by Sarah Lenton. Morehouse Educational Resources, 2012. Sarah Lenton’s three-series books and CDs based on the Sunday Gospels in the Revised Common Lectionary are extremely comprehensive and instructive for children’s worship. While particularly well suited for Episcopal and Anglican congregations, any liturgically-oriented congregation could benefit from the careful planning and helpful insights these resources provide. The book begins with an introduction to children’s ministry in general and its place in the life of the church. These include how to establish a children’s worship ministry, care for and train leadership, and establish patterns of safety and accountability. A brief introduction to the needs and specific characteristics of various age groups follows. Lenton then presents well-written scripts for every week of the church year. These include pictures, outlines, suggestions for implementation, timelines, and worship and prayer suggestions. Checklists and audio-visual suggestions are also included. An added feature is a comprehensive list of “useful extras”. These include everything from furniture arrangements to props and costumes that might be helpful if available.